Melt your stress away, plus enjoy the thereapeutic benefits of aromatherapy essential oils, without worrying about the harmful effects caused by the toxins found in commercial bath care products. Compare and shop for all natural aromatherapy bath products, or... find out how safe your bath care products are with our product ingredient review. Treat your body right and avoid the toxins! Relax without worry with natural aromatherapy bath products! Most commercial bath oils, salts and soaks can and do contain a variety of toxic and potentially harmful ingredients which may result in eye and skin irritations, allergic reactions and skin rashes ... Some are even known to cause cancer or other serious health conditions! Use Organic Natural Aromatherapy Bath Oils, Bath Salts and Soaks for a Wonderful and Safe Bath Experience! Conventional bath oils contain synthetic fragrances, as well as FD&C colors, alcohol and lanolin which can all cause allergic reactions. Other chemicals, like TEA (a skin sensitizer and cause of contact dermatitis) and sodium lauryl sulfate (SLS), can form carcinogenic nitrosomines. Mineral-based bath salts are sprayed with synthetic dyes and scents, and can contain other ingredients irritating to skin and mucous membranes. Bubble baths are also full of dyes, colors, scents and preservatives, as well as sodium lauryl sulfate and hormone disrupting parabens. They have been implicated in many cases of bladder, urinary tract and kidney infections. Soaking in hot water increases skin permeability and exposure to harmful ingredients. How Safe Are Your Bath Oils/Salts/Soaks? 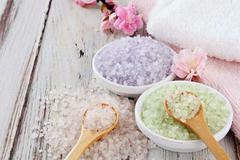 Keep it simple and safe with all Natural Aromatherapy Bath Oils, Salts and Soaks and look and feel fabulous! Choose Organic Aromatherapy Bath Products, because you ARE worth it!